City Engineer Dave Solberg rapped on his desk – knocking on wood – as he said that construction on the Grand Avenue pedestrian bridge is moving right on schedule for its Aug. 21 completion date. “It’s pretty much on time and on budget,” he said. “It’s been a sweet project.” The bridge closed to traffic in April to allow construction workers to remove and replace the concrete deck and old railing. The piers and beams of the bridge were in good shape and served as the foundation for the new walking surface. The new deck is two feet wider, allowing for greater ease of travel during high-traffic times. Many of the features of the bridge were designed to echo the design elements of downtown Eau Claire. The new railing is the same as what is used throughout Phoenix Park, and the walkway will be lit with the same “shepherd’s hook” street lamps that are used throughout downtown. Decorative lights in the style of the Phoenix Park bridge will glow from the abutments. 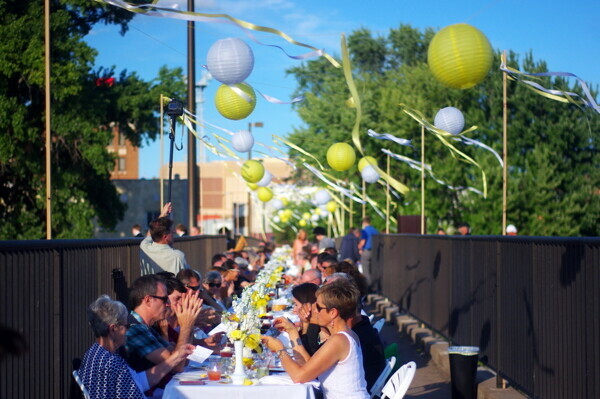 “A lot of times electrical is that one item that’s kind of a wild card,” Solberg said, but he expects a smooth finish in time for the annual Grand Evening on the Bridge on Aug. 22.